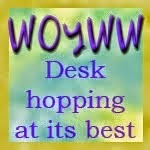 Hello lovely people and welcome to my first WOYWW of the year, If you don't know what I am on about, visit Her LadyshipJulia at The Stamping ground. We have had problems with our electrical power circuit which keeps tripping and setting off the alarm, amongst other things, so the electrician was summoned and the decision was made that the alarm needed to be run straight from the fuse box and not on the power circuit. So where was the wiring that had to be altered? 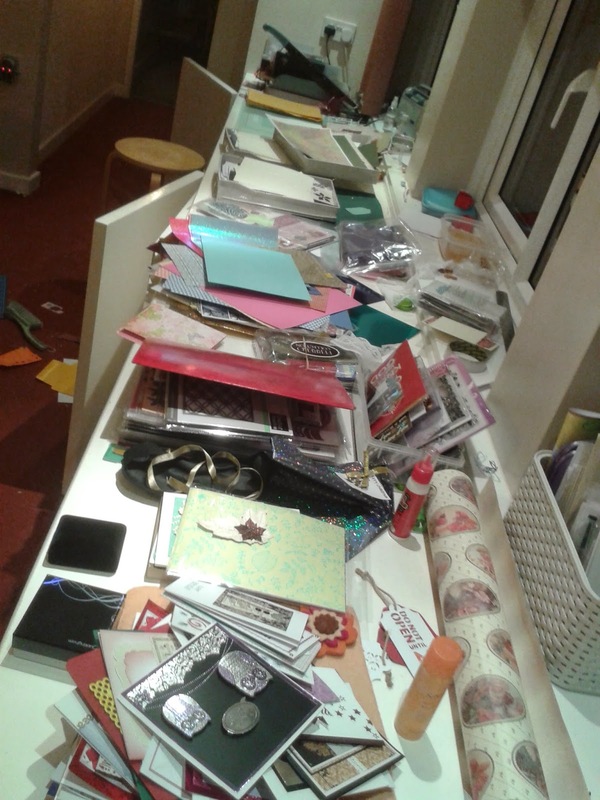 Running along the back of my craft cupboard, he would come back on Friday, so last Tuesday everything came out of the cupboard, leading to this chaos. In addition of course I had unreliable power supply for my computer, so didn't dare try to do a post last week, because the poor thing has had its power supply withdrawn randomly at least twice a day for several weeks, and keeps suggesting that I turn it on in safe mode. 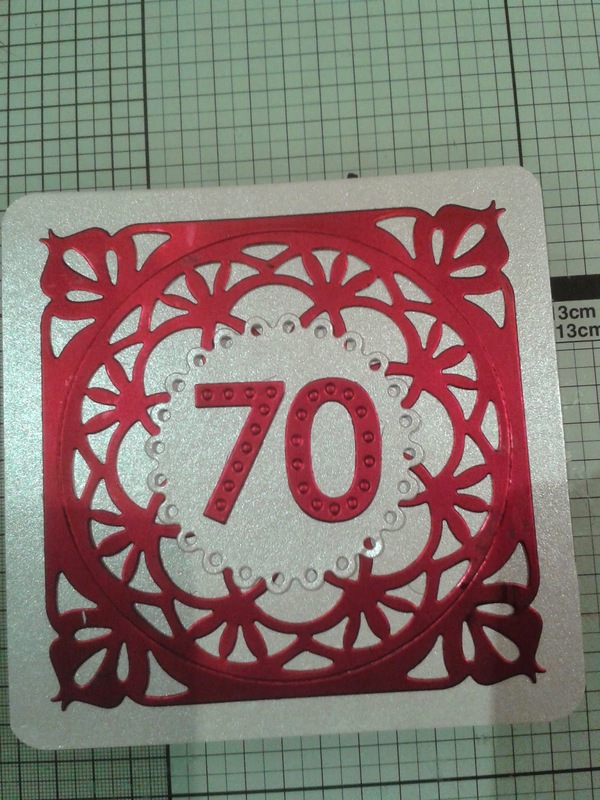 Anyway, in the middle of that chaos, I just had to create a 60th birthday card for brother in law and a 70th card for a friend, so a serious right shove cleared sufficient space to make these two cards. 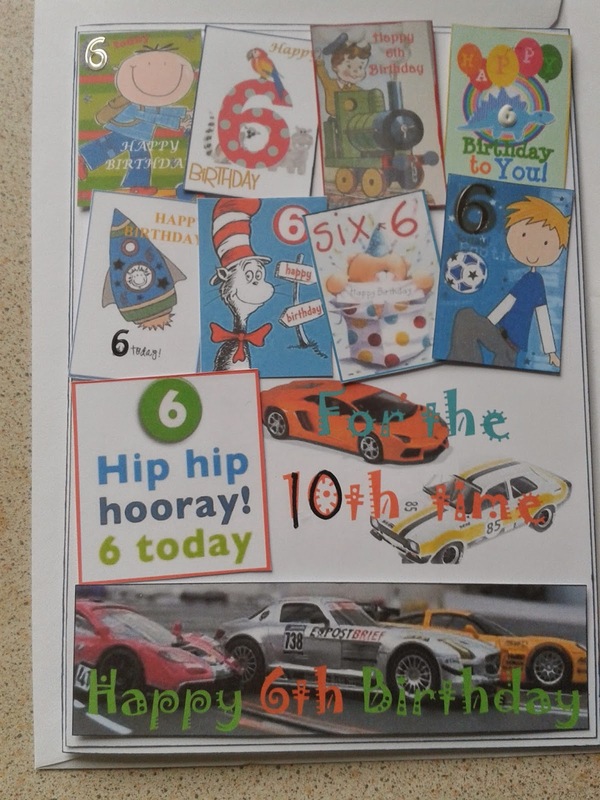 My brother in law is so into Scalextrics cars that all he wanted for his 60th birthday was 'toy' cars, so we decided that he was never going to grow up, just continue to play with toys like a six year old for the rest of his life. Now for a bit of not so good news. I did a lots of knitting for Christmas, if you look back to my Christmas eve post you will the doll I knitted and this is the tea cosy I made for my niece and the result is that I have repetitive strain injury, or tendonitis and I am not supposed to be doing any knitting and limiting computer use to a bare minimum, so for a few weeks at least, I will probably not do a WOYWW each week, but may do a little bit of visiting each Wednesday. I will try to return visits to this post, but will otherwise save my arm for important things, like doing my bra up and brushing my hair and lifting a cup to my mouth. I'm enjoying another twinnie fun day here so am just grabbing 5 mins to visit my fav blogs. So sorry to hear of your hand problems (I have days like that too 😒) really hope it eases soon but til then do all the right things and rest it. mm , well Chris!!! who would have thought knitting could be dangerous to life and limb??? Great work on the cards.. Sorry about your electricity and also computer... one thought about the latter (will pray for the former to sort out) is that maybe you could do a Disk clean up and Defragment it as well. If you need to know how that, pm me. My computer is old (six years too:D) and it likes to be done every month or so and then is quite ok. But notice when it want to be redone. I think I would cry if I had to tear my room apart to let the electrician in!!! What a lot of work that must have been. I hope your arm feels better very soon! That's a fantastic 60th birthday card. Laughed and laughed. It made me feel good to see that you are donating to a local hospital. They can certainly use the paper, I'm sure. And I know it will be appreciated. So, that impressed me a BUNCH!! Thanks for visiting while I slept. Happy WOYWW from #2. Aww bummer about the tendinitis. I know several knitters who overdid it and had to take some time off. 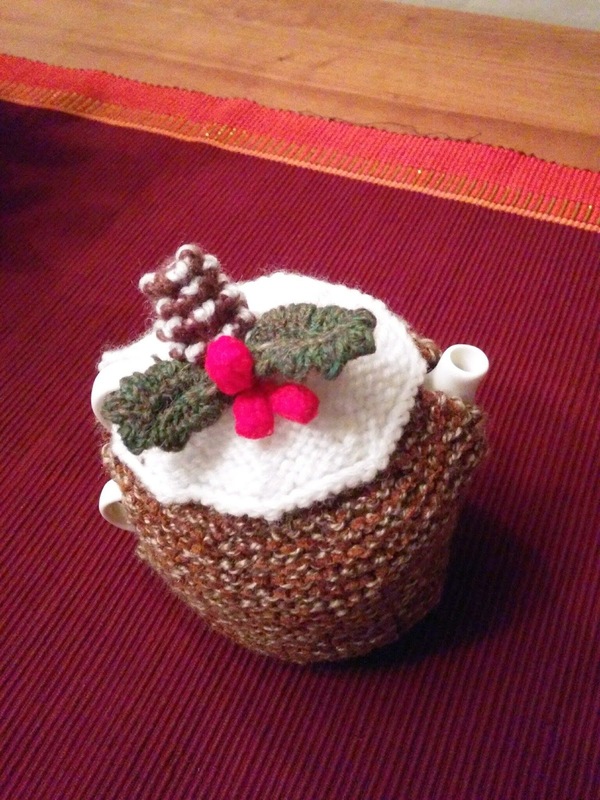 I do love that tea cozy, though! That's a good idea with the paper donation. Must remember that one - and include other stuff as I need to tidy up a bit (read get rid of stuff). I hope your RSI clears up quickly and you are soon able to work with less pain. I absolutely love that tea cosy, I bet she was chuffed with it. Oh Chris, all that love and effort in the knitting and now you're hurting..am so sorry, but take the advice and be very careful! By the way, the tea cosy is really splendid! I'm sorry too about the electrics and the emptying of the cupboard -Ah me...forced to sort and clear, not one of my favourite past times s you've probably read! !